Discovery is an early season dessert apple cultivar. One of its parents was the Worcester Pearmain, with the pollinator thought to possibly be Beauty of Bath. 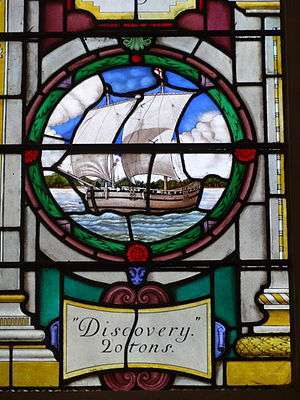 Discovery was first introduced to the market by the Suffolk nurseryman Jack Matthews. 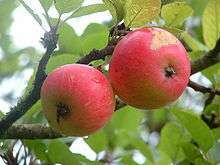 In around 1949, George Dummer, a fruit farm worker from Blacksmiths Corner, Langham, Essex, raised several apple seedlings from an open-pollinated Worcester Pearmain. He decided to transplant the best of the apples into his front garden, although the young tree was left unplanted and exposed to frost, wrapped only in sacking, for several months due to a family accident. The tree survived and later came to the attention of Matthews, who took grafts and developed it (initially under the names 'Dummer's Pippin' and 'Thurston August') before releasing it to commerce under the name 'Discovery' in 1962. By the 1980s it had become the main early variety in the UK, though became rarer in later years as imports supplanted early apples in the market.